For some reason I’ve been finding myself exploring the Museum District of Richmond a lot lately, and I don’t hate it! 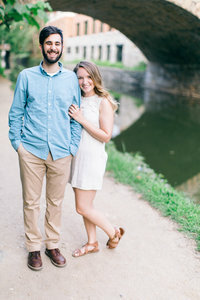 Billy and Stephanie live close by to the VMFA, so it was so natural for them to explore that space to take their engagement photos. We also got to take photos at the spot where Billy proposed, which made this session ever more special. Their pup even got to join us for a few photos (scroll to the bottom!). We can’t wait to celebrate their wedding day with them at King Family Vineyards next year!! Want to get to know them a bit more? What is your dream date night? 2. Our ideal date night is actually very low key. We love being outside, especially in the mountains. If we could just sit around a fire, listening to some good music, and drinking a good beer, that would be just perfect for us. 3. Billy and I had a relaxing and low key day on the 4th of July. He asked me if I would want to do something casual to watch fireworks. He suggested going to Libby Hill Park (he didn’t think many people would be there – not true!). We found a spot to sit, packed in with hundreds of other people. Then, we happened to see some friends walk by and they invited us to watch the fireworks with them (not exactly a good time to propose!). The big moment came after the fireworks were over and we were walking through the park!! I didn’t suspect anything until right before it happened!! What are you most excited about for your wedding day?? 4. We are most excited about spending the day and weekend with all of our favorite people!! In the whole planning process, having fun continues to be at the forefront. We can’t wait to laugh and dance the night away with everyone! !